Juvenile. 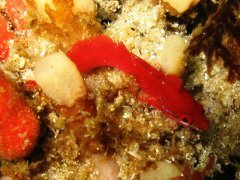 Red specimens are usually associated with membranous red algae. Yellow specimens are usually associated with yellow hydroids. Green specimens are usually associated with Caulerpa. This one was displaced. 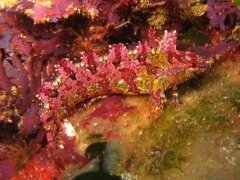 Pink specimens are usually assoicated with coral plocamium. Specimens like these are often found, especially at night, within the branches of fan corals. 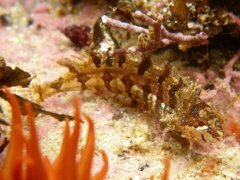 blue-grey specimens are usually associated with smoky hydroids. A very pregnant female with unusually bold colouration which does not reveal any association. SURG co-founder Guido Zsilavecz photographed the first specimen of this species in May 1997. Initially it was believed to be a Pavoclinus pavo. 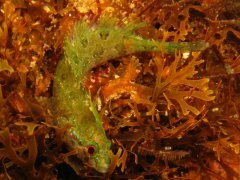 Due to the colour variabilty of these fish, where a colour variety was usually associated with a specific type of seaweed or hydroid, Guido investigated how many distinct types could be found. Persistent differences in those "with blue spots" and those "with green lines" on the head, led to the realisation that there were consistent physical differences between those two. It was established that blue-spotted fish were a new species of Clinid, which Guido described. 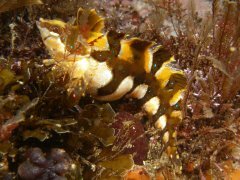 Initially it was thought that the species occurred only in a number of discrete colours, directly attributable to camouflage within a certain species of hydroid or algae. During collection dives it was observed that larger specimens of the super klipfish Clinus superciliosus would catch or attempt to catch unsettled bluespotted klipfish, and the bluespotted klipfish clearly seemed to be part of the diet of opportunistic super klipfish. 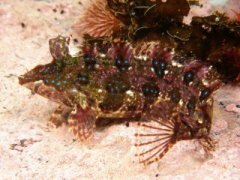 It was concluded that the colouration was thus likely to be a defensive adaptation, and fish of a specific colour would stay within the right colour environment, and could not be coaxed easily to settle in a contrasting environment. The question then arose as to whether individuals of specific, differing, colours ever met to mate, or whether a potential speciation process was underway, with the various colour variations slowly diverging. Newly born young were all white, turning red early on in their development. This was observed from juveniles of differently coloured females, so it was likely that the juveniles would disperse, settle anywhere, and adapt the colour from their environment. While an experiment was performed to see if adults would change colour, this was not conclusive. Rearing newly born juveniles proved to be dificult and no colour change except of the turning red was observed. Subsequent to publication of the description many individuals which seem to be "hybrids" in their colouration have been observed and photographed. 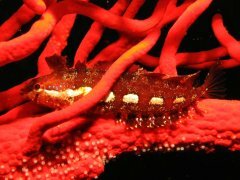 It is not possible to ascertain in which environment these individuals would remain, and these individuals were simply observed on a non-homogeneous reef. Pavoclinus caeruleopunctatus, A new Species of Clinid Fish (Perciformes: Clinidae) from South Africa, Guido Zsilacecz, Special Publication No. 66. JLB Smith Institute of Ichthyology, Grahamstown. Coastal Fishes of the Cape Peninsula and False Bay, Guido Zsilavecz, 2005.